Yesterday I posted on Facebook that when I think about Josh becoming a daddy, “I think I may actually just burst”, and apparently I meant literally! 😂 My water for baby boy broke around 4:15 pm last evening, which means it’s go time! We checked in to the hospital and are so thankful for our amazing team of doctor and nurses assisting the babies who are leading the way. Here’s the plan: KEEP BABIES IN UNTIL WEDNESDAY. Thankfully I am not in labor which makes this plan more realistic (for now.) Since the babies are 34w5d, we are working to beef up their lungs and prevent brain issues by doing 2 rounds of steroids 24 hours apart, along a magnesium drip and antibiotics to prevent infection for baby boy. Both kiddos seem to be doing great despite the circumstances and so we take it hour by hour and pray that God allows these medications to take full effect over the next couples days. Although we were praying and hopeful they wouldn’t need NICU time, we know this won’t be an option for now, so we are transitioning our thinking and expectations, knowing full well God has known their birthdays and birthing stories from the beginning. Would you join us in praying for us (again?). We are sooooo beyond excited and filled with peace and pray our son and daughter arrive safely, healthily, and perfectly in the coming days. And also, for me, as there are many risk factors playing into things, that delivery, whatever it looks like, be safe and preferably non-emergent? Our phones aren’t top priority right now so please don’t be offended if we don’t get back to a call or text … we will do our best to keep you all posted! Thank you thank you thank you! Sending you lots of love and strength!!! My twins were born at 34w6d and spent 3 weeks in the NICU as feeders and growers and were completely healthy! I had the magnesium and steroid shots too!! They are super healthy almost 2 year old now and I know your babies will be just fine!!! Good luck to you! Cannot wait to hear about your birthing story!! Praying all goes well for you two. My daughter Jill had twin boys (they are 4 now). What a joy to have twins! Yes, I’m praying, and may God greatly bless you as you fight for these beautiful lives. Bless you all! Twin mamma here too! Just get through each hour, each day. Just lean on the Lord, and try not to have any expectations but healthy babies. Breath, and I know it sounds silly – but enjoy these last few moments of just you and your husb. Try to get some rest. Your next couple of months will be very challenging, but rewarding at the same time. My high risk doctor had kind of warned me that my boy would probably have some time in the NICU, they called it “wimpy white boy syndrome” because it only happened to preemie white males (lung/respiratory issues). My son had 9 days in the NICU and my girl had none, and came home with me. Both are very healthy growing babies. Praying for the doctors that will be handling your labor/birth, bless these hands Lord for they will be delivery miracles. Sending positive thoughts and prayers! The steroids and magnesium did you the trick for my twins and both came out crying and were on room air the next day. Had intense hot flashes on the magnesium! Enjoy these last days of feeling those kicks and squirms in your belly! Yes!! I felt like I had an iron on my face at times, but so worth it! We are eagerly awaiting news of your little ones safe arrival. Trusting that God is carrying on to completion the good work He has started in you and your son and daughter. Blessings dear Chelsea. Carrying you in prayer. Praying for you and your precious babies…God is watching over them and He is in control of every detail…God bless. Sending you lots of love! Take care of yourself and the little ones! Praying for healthy delivery! And that this good work God has began he will complete it! 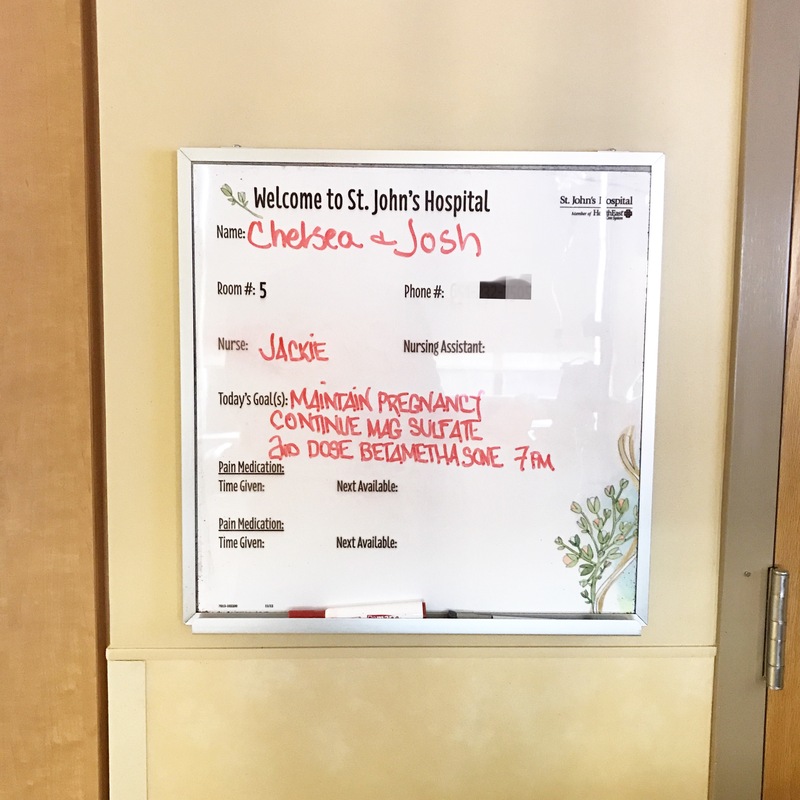 Chelsea, praying for you, Josh and your son and daughter. Each of you are His Beloved, he is holding you ever so close. Love you lots. praying for a safe arrival! I’ve been thinking about and praying for you, your husband and the babies. My son was born at 34+5 and was in the NICU for 3 weeks. It can be an overwhelming experience of joy and fear at the same time. Praying they just need a little help with feeding and growing and will be home quickly! One resource I found helpful as a NICU momma was http://www.handtohold.org. There are lots of podcasts, blog posts, and even a section to pair you up with another mom whose been through a similar experience to just talk with.